The single greatest challenge when attempting to communicate is to have the intended meaning of the given message recognized and understood. People may hear what we say or read what you compose but, more often than not, they do not know what we mean…and sometimes we don’t either. Clarity of thought must precede clarity of expression. 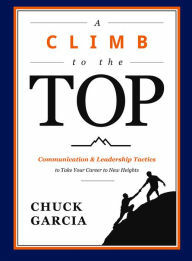 Chuck Garcia demonstrates that throughout his lean narrative. He carefully follows the “Ten Commandments” he affirms. There are no head-snapping revelations among them with an emphasis on having emotional appeal, speaking with conviction, etc. However, the information, insights, and counsel he provides are more than sufficient to meet the needs of almost anyone who is challenged to communicate more effectively. I also highly recommend it as a gift to those who are now preparing for a career or have only recently embarked on one. Thank you Bob for such a succinct and elegant review. Your review is spot on to what I was aiming for when I wrote A CLIMB TO THE TOP. I wanted to keep the material lean, actionable, and easy to implement. I’m privileged to help others with their career ascents and grateful you took the time to read and review the book.